An invaluable quality of stone is that natural stone like marble is that it can be refinished after damage. Marble refinishing in NYC is cheaper and easier to do than the total replacement of the stone. The refreshing of the stone can result in a surface that looks as good as or better than it originally looked. The stone refinishing or restoration process involves altering the surface of the stone for it to have the desired finish. For example, it may be taking a polished finish stone to a satin one. Statewide Stone Care has been refinishing marble and other stones for over a decade, we understand the art of refinishing stone is art because stone is truly beautiful. You should always take the proper measures when refinishing stone because it would tragic to ruin it. Here are a few things you should look out for when speaking to contractors. Before anything else, you should check the credentials and reviews of the company. Make sure they’re reputable, licensed and reliable. On our website you can see great reviews of our past service. The stone services do not require topical coating as it reflects the light in its natural form. It only needs finishing or polishing that has been professionally done. Ask what the contractor intends to do beforehand to reach the desired finish. At Statewide Stone Care, we are capable of restoring your marble and we’d never add unnecessary costs to our services to make more money. From the beginning we will be clear on what we will, how we will do it, and when we will do it. There may be other surfaces surrounding the stone surface such as carpet or wood. A professional restoration contractor will determine how to protect these surfaces. Water that may be used in grinding may damage other surfaces around the stone. Get to know of the plan beforehand or have it written in the contract. Working with stone is our specialty but we are also conscious of the other surfaces in your home. Keep away from firms that just send you quote without first looking at the work to be done. It is important that the professionals see the condition of the stone and ask you about the desired finish. 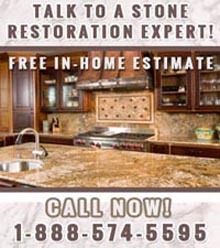 We give free in home estimates to assess your stone and the work that has to be done for your benefit. To learn more about our marble refinishing in NYC, please call us at Statewide Stone Care today at 1-888-574-5595.